A.S. Echo under the U.S. flag in the Pacific, c1943. Built in 1905 by William Brown & Sons at Wairoa the Echo has been described as one of the sturdiest and finest scows ever built in New Zealand. All timber was of the highest quality kauri and totora and it was said that the worm geared centreboards could be handled by one man. 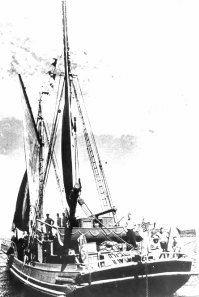 On launching, the 104 ft scow was rigged as a topsail schooner with a small berthing engine being its only other source of power. It was first owned by Karamea Steamship Company then bought by Richardson's of Napier in 1916 who used it to transport frozen meat overseas. In 1920 T. Eckford & Co Ltd. bought the ship for their Blenheim to Wellington freight run, removing the topsail and installing large diesel engines. It reached a top speed of 4 knots and could carry a maximum cargo of 125 tons per crossing. With the occurrence of war in the Pacific the Echo was requisitioned by the Government in 1942 for wartime service. The Government in turn loaned it to United States forces who soon quickly discovered its qualities as a supply ship. Between June 1943 and late 1944 she had travelled 40 000 kilometres. In 1944 A.S.Echo was sold back to the Eckfords who immediately set to work to recondition the rotten and teredo worm infested hull. Within months Echo had returned to her bi - weekly sailing to Wellington. As Echo continued her service for T. Eckford & Co Ltd. Her fame began to grow in the United States. In the late 1950s a Hollywood movie was made of her exploits but unfortunately the real Echo was unable to be removed from service so another vessel was used instead. By the 1960s with growing competition from Picton and Lyttleton Echo's sails were yet again reduced and more powerful Gardiner diesel engines were installed to give her a top speed of eight knots. Even this was not enough to compete with the newly introduced Picton rail ferry Aramoana so in 1965 the little scow made its last crossing of Cook Strait. In 1972 the Marlborough Cruising club bought Echo and took her to Picton where she was used as there club rooms for many years. However by 1990 she was in such a poor state of repair that she was abandoned and was to be sold for firewood. However in 1992 Echo Gallery bought her and set to work to restore A.S Echo to her former glory.